2013-03-14 Music Lover at head-fi.org Read More.. “.......it sounds better." 2011-10-26 mad goat at Hubpages.com Read More.. “… is a perfectly realistic achievement which provides you with an accurate sound reproduction at a silly affordable price!" 2010-12-07 Walid Mohanna Read More... ...I got the amp last week and I just wanted to let you know that I am extremely pleased with it! 2010-11-15 Music lover at Dooyoo.co.uk in English Read More... "...I was pleasantly surprised by the how low in the base department this pair can get and I was also greatly impressed by just how much detail and musicality"
2008-02-26 Youtube.com, Read More... "Wireless Audio with Trends Audio TA-10K"
2007-08-06 www.audio-trends.com. Read More... "more fun for Trends Audio TA-10 Modding"
2007-07-01 Head-fi.org. Read More... "The TA 10.1 is a great little amp "
2007-06-25 Ilouge.com, Audiophreak. Read More... "high quality amps like the Trends TA-10.1." 2007-05-31 Refefer. Read More... "Trends Audio is the strictest music maker"
2007-05-02 Audioreview.com. Read More... "Fantastic product." 2007-03-10 www.prixdumatos.com. Read More... "Enjoy the music with Trends TA-10"
2007-03-02 Homecinema-fr.com Read More... "Good combo for Trends TA-10 amp & Trends PA-10 pre-amp"
2007-02-19 Audiocircle.com. Read More... "when i plugged in the Trends I was shocked at what this mini integrated can do." 2007-02-01 Minhembio.com. Read More... "The best Class T amp in the market "
2006-10-28 hear.nl. Read More... behoort dan weliswaar niet tot de absolute top maar is voor deze prijs echt een koopje. 2006-10-24 diyAudio.com. Read More... "...Very nice right out of the box. Smooth top end." 2009-11-15 Harry Saini ,at digitalsmarthomes.ca Read More... "very 3-dimensional; very smooth and full-bodied with good resolution and air." 2009-04-22 Vernon at audiokarma.org Read More... "a tube preamplifier and two power amplifiers which sounds wonderful. " 2009-02-21 Nahaz at minhembio.com Read More... "Detta är en fantastisk låt, en av mina favoriter och PA-10 gör den klar rättvisa." 2008-12-31 head-fi.org Read More... "This amp should be a lot of fun to tube roll with." 2011-01-06 Читать далее at nnm.ru in Russian Read More... "Hi End с ноутбуком ..Маленькая коробочка обеспечила великолепное звучание." 2011-01-06 Читать далее at nnm.ru in English Read More... "Frankly, I'm pleasantly surprised by its sound..."
2008-07-09 Hardforum.com Read More... "My little UD-10 is a first generation product...Truly remarkable sound. As a PC transport, it is tops." 2008-01-19 audiocircle.com, Part 2. Read More... "Highly recommended! " 2007-10-29 head-fi.org. Read More... "Trends Audio UD-10.1 Gets Me A Little Deeper Into Computer Audio"
2007-10-11 Groups.google.com Read More... " It really is an extraordinary piece of hardware. " 2007-07-22 audiocircle.com. Read More... "Trends Audio UD-10, wow! PC Convert"
2007-04-18 audiogon.com. Read More... "For the price, best USB to SPDIF converter I have heard,"
2007-03-13 Vr-zone.com. Read More... "planning on just stereo for the PC, this is a good investment IMO. " 2007-01-11 odysseyaudiohk.com Read More... "UD-10 is far better than M-Audio Transit." 2006-12-19 bbs.erji.com. 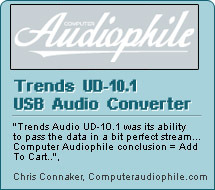 Read More... "Trends Audio UD-10应该是这个价位上USB -> 数码的最好选择…"